For this Nurses' Week Celebration we have decided to highlight the struggles, efforts, and accomplishment of most exceptional nurses in American History. Throughout the week, we're highlighting a few of these nurses and how they have shaped our history and showed us what happens when nurses unite, act together and bring about social change. We kick off the lists with somebody true phenomenal and true to the cause of helping a human being. Clara Barton, or as she preferred to be called 'Clara' was by no means an ordinary nurse. She is one of the most honored women in American History. She was known as the "Angel of the Battlefield" during the Civil War and assigned special duties by President Lincoln. But one of her greatest achievements was helping the International Red Cross during the Franco-Prussian War, which led to her forming what we know today as the American Red Cross. 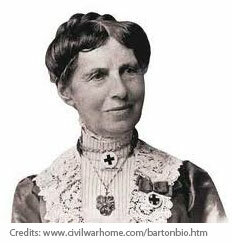 Clara Barton was born Clarissa Harlowe Barton on December 25, 1821, in Oxford, Massachusetts. Barton spent much of her life in the service of others. She found her calling as a caretaker when she nursed her little brother when he felt sick. Clara became a teacher at age 15 at a time when most teachers were men. Later she opened a free public school in New Jersey. She moved to Washington, D.C., to work in the U.S. Patent Office as a clerk in the mid-1850s. At age 60 she established the American Red Cross and managed it for the next 23 years. Her great understanding of people in needs and distress has paved a way for volunteering services and organizations. Barton kept interests in other fields, such as education, prison reform, women's suffrage, civil rights, and even spiritualism. Her favorite color is noted to be 'red', so it comes to no surprise that the organization was named 'American Red Cross.' Clara Barton published many books about the early days and formation of the American Red Cross and the global Red Cross network. She also wrote The Story of My Childhood, intended as one of a series of short autobiographies detailing aspects of her life which she never completed. She died on April 12, 1912, at her home in Glen Echo, Maryland, and is buried in the Barton family cemetery plot in Oxford, Massachusetts.